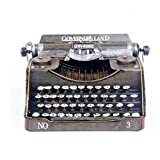 I love the website Etsy because only there will you find something as uniquely fantastic as these cool new and totally retro USB Typewriter Computer Keyboards. These antique typewriters have been repurposed, restored, and updated for the modern age as USB keyboards for PC, Mac, and iPad, but they also double as fully functional typewriters that can type out a backup hard copy on an old-fashioned sheet of paper. 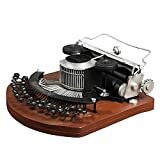 The nostalgic and strangely satisfying clickety-clack of keys striking the paper while updating the digital text onscreen is perfect for anyone looking to write the next great novel, a blogger furiously typing out a bombshell article, or just anyone who loves the beauty and tactile typing experience of a classic typewriter. 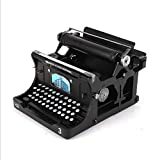 Each USB Typewriter is available in many different styles or a conversion kit can be purchased as well to update your own typewriter of choice. Check out this video to see it in action.